It has been a crazy month and I have been so busy that I hadn’t had time to write recipes, my sister came to visit from Mexico and she was with us for two weeks, we had such an amazing time with her, but sadly her holiday finished and she had to go back. Anyway, soon we will see her again. Today’s recipe is one of my dad’s favourite soups with my own touch, “Sopa de garbanzos” (chickpea soup). 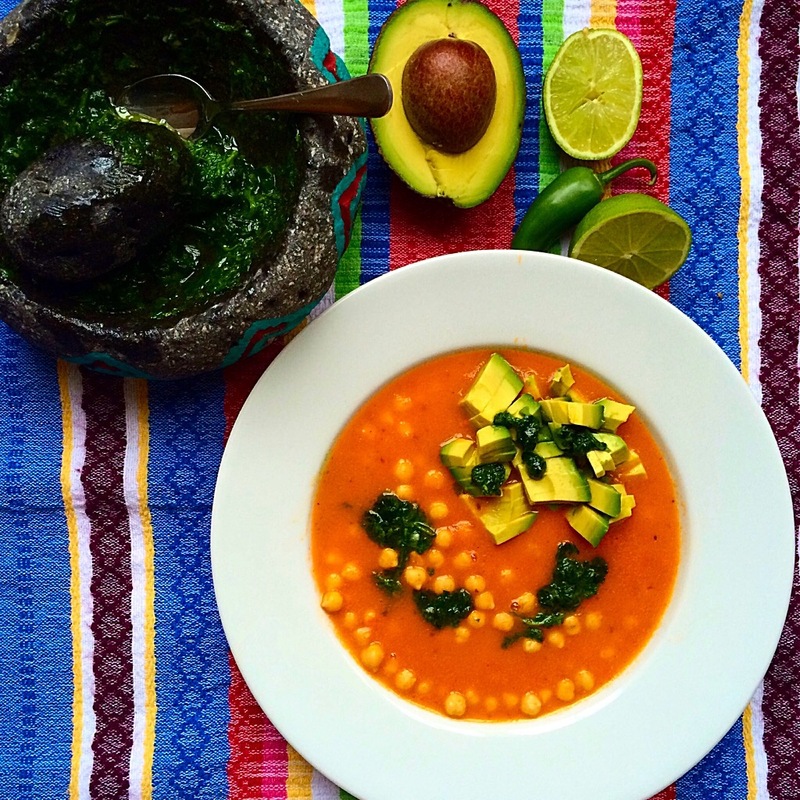 In Mexico chickpeas are not as popular as beans, but there are some nice mexican recipes with them like this soup. My dad used to make this soup when there was not much to cook in the cupboards or fridge, it takes no time to be prepare specially if you use tin chickpeas. So here is the recipe, I hope you enjoy it as mucy as I do. Heat the rapeseed oil in a large casserole dish and add the onion, garlic and tomatoes, fried for 5 min. Add the chipotle chillies, tomato puree, salt to taste and pinch of pepper, then blend the sofrito (sauce) until smooth. Drain the chickpeas and add them to theconsommé, then add the pints of water and cook for 10 min. While the soup is cooking make the salsa verde. Chop all the herbs and garlic. Put the garlic and salt in a pestle and mortar and mash it, then add the herbs and capers and ground them very well, after add the juice of lime, olive oil and mix all the ingredients and the salsa verde is done. Cut the avocado in cubes. Serve the soup in a bowl, add some avocado and salsa verde and enjoy with warm corn tortillas or a piece of nice sourdough bread. Hola Michelle, gracias por el bonito comentario, sí salió súper deliciosa. Mi papá no le ponía chipotle ni salsa verde, pero el chipotle le da muy buen sabor. Yo siempre cocino cosas sencillas, pues con dos niños no me da tiempo de hacer cosas complicadas. Un besito muy grande ?? Jajaja, sí! Ya con hijos la verdad mientras más simple y rápido, mejor, y es padrísimo cuando podemos encontrar cosas así y además deliciosas. La voy a hacer y te cuento ?. Un beso Karla!